So for Breakfast on this Christmas Eve morning I toasted a Healthy Life Whole Grain English Muffin and topped it with some Smucker’s Sugarless Blackberry Jam. Also had a cup of Bigelow Decaf Green. Rolled out to grab the Morning Papers and it was around 20 degrees with a cold breeze. Had snow move in later in the day. Really nothing going on here for our Christmas Eve. Did a few things around the house and a load of laundry for Mom. For Dinner tonight I prepared Breaded Alligator Nuggets and Stuffed Jalapenos w/ Crab and Shrimp. It had been a while since I had any Alligator, “Gator’, so I went to the Cajun Grocer website and purchased a few items. I ordered some HEBERT’S SPECIALTY MEATS Stuffed Jalapenos w/ Crab and Shrimp, Alligator Tenderized Fillets, and Alligator Nuggets – BREADED. So for Dinner tonight I’m preparing some of the Stuffed Jalapenos w/ Crab and Shrimp along with Breaded Alligator Nuggets. I’m using Country Boy Gator – Alligator Tail Meat Spicy Cajun Style that I had purchased online from Cajun Grocer. They have a great selection of anything Cajun you could want and more. They come Frozen and already Seasoned and Breaded. To prepare them I pan fried the Nuggets. I used a medium size skillet, sprayed it with Pam Cooking Spray and added a tablespoon of Extra Light Olive Oil. Heated it on medium heat. I checked the Oil and when it reached 350 degrees I added my Gator Nuggets. I fried them for 7 minutes turning them over after 4 minutes. They come out Golden Brown. Love the Gator Meat, as they say ”It tastes like Chicken!”. It really does but it’s has a light sweet taste to it like Crab Meat. I served it with some McCormick Tarter Sauce for dipping. The Stuffed Jalapenos are, HEBERT’S SPECIALTY MEATS Stuffed Jalapenos w/ Crab and Shrimp. To prepare these I’m baking them. I preheated the oven to 375 degrees. I then got a small baking sheet, lined it with foil, and sprayed the foil with Pam Non-Stick Cooking Spray. I then grabbed some of the Stuffed Jalapenos and lined them up on the sheet. Baked them for a total of 38 minutes. Well I’ve got me a new side dish to have on hand! These are delicious. Good size Jalapenos with plenty of Crab and Shrimp Stuffing. Really enjoyed these. I’m going to have to try more of the HEBERT’S SPECIALTY MEATS products. For Dessert/Snack later a bowl of Skinny – Pop – Pop Corn and a Diet Peach Snapple to drink. FROM FROZEN – Bake uncovered at 375 degrees. Hebert’s produces Cajun Favorites boudin, Boneless Stuffed Chicken, Boneless Stuffed Turkey, Turduckens, Shrimp or Crawfish Etouffee, Boudin, Shrimp and Crab Stuffing, Andouille, Crawfish Pies, a variety of Green Onion Sausages, and many more. Cooking instructions: Fry at 350 for 5-7 minutes until golden brown. For Breakfast this morning I fried up some Simply Potatoes Shredded Hash Browns, heated up a couple of Jimmy Dean’s Turkey Sausage Links, toasted 1 slice of Healthy Life Whole Grain Bread, and had the morning cup of Bigelow Decaf Green Tea. Stayed in the 50’s overnight but rained most of the night into the day. Cloudy and rain on and off all day, but still in the 50’s but cold weather moving back in by tomorrow. Gave Mom a hand with the laundry and then it on to house cleaning. Later in the day I went through what Mom refers to as the “junk drawer”. Started going through it keeping some junk and pitching the rest. I’ll have to finish up tomorrow. So for Dinner tonight I’m using the Gator I purchased last week. Tonight its Spicy Cajun Style Breaded Alligator Bites w/ Baked Fries and French Bread. I’m using Country Boy Gator – Alligator Tail Meat Spicy Cajun Style that I purchased online from Cajun Grocer. They have a great selection of anything Cajun you could want and more. They come Frozen and already Seasoned and Breaded. To prepare them I pan fried the Nuggets. I used a medium size skillet, sprayed it with Pam Cooking Spray and added a tablespoon of Extra Light Olive Oil. Heated it on medium heat. I checked the Oil and when it reached 350 degrees I added my Gator Nuggets. I fried them for 7 minutes turning them over after 4 minutes. They come out Golden Brown. Love the Gator Meat, as they say ”It tastes like Chicken!”. It really does but it’s has a light sweet taste to it like crab Meat. I served it with the absolutely best tasting Remoulade Sauce I have ever tasted, Louisiana Fish Fry Products Remoulade Dressing. Man oh man this stuff is incredible. It has that hint of Horseradish and just a tad of heat. Perfect for any Cajun Seafood or any Fish. To go with my Gator I baked some Alexia Organic Yukon Select Fries leftover so I prepared them to go with my Burger.Seasoned them with McCormick Grinder Sea Salt and Black Peppercorn Medley. Baked them at 425 degrees for 16 minutes. They bake up beautifully and seasoned just right, excellent Shoestring Fry! Plus they are only 120 calories and 15 net carbs. I also reheated a couple of slices of Pillsbury French Bread that I had baked yesterday. For Dessert later a bowl of Breyer’s Carb Smart Vanilla Ice Cream topped with some Smucker’s Sugar Free Hot Fudge Chocolate Topping. Our farm raised alligator nuggets (a.k.a. alligator bites) are breaded or pre battered. Best prepared by deep frying. Enjoy! Our alligator meat is of the utmost quality. We offer premium farm raised alligator meat raised locally in south Louisiana. Whether it’s alligator sausage, hamburger patties or fresh tenderized fillets, we offer the best Louisiana has to offer. Came across this article on Gator Meat, which I’ve tried several times and loved it. I have a package of Breaded Gator Tail Bites in the freezer. Anyway just wanted to pass this article along, very good article. Industry hit hard by recession, but meat is popular again. SANFORD, FLA. — The market for gator meat has exploded in the past couple of years, pushing the price in Florida to its highest level ever. The upswing is a relief for alligator farmers and trappers whose businesses were devastated by the recession. Allen Register, chairman of the Florida Alligator Marketing and Education committee and owner of the Gatorama alligator and crocodile attraction in Palmdale, Florida, agreed. The wholesale price of alligator meat hovered between $4 and $5.50 a pound from 1980 until 2011, when it rose to $5.75, according to the Florida Fish and Wildlife Conservation Commission, although some farmers and trappers say it dipped as low as $3 during the recession. The price took off in 2012, jumping to $7.50, and rose to $8.25 in 2013, the last year for which the state has records. It’s about $8.75 now, Register said. The price of the hides is more volatile and took a beating during the recession, when it plummeted from $43.75 a linear foot in 2008 to $15 in 2009 and 2010, according to the commission. For two or three years, it was impossible to sell hides because people weren’t buying high-end leather goods, trappers and farmers said. “You have to have the value of the meat and the skins to make any money off it,” said Terry Parlier, a former nuisance-alligator trapper who owns a gator-processing plant near Clermont, Florida. To survive the ups and downs of the market, some alligator farmers turned their businesses into tourist attractions. Others, such as Jimmy and Linda Boston of Seminole County, rely on crab, catfish and some eel sales. Jimmy Boston, 71, rises before dawn to catch the catfish and eel himself, and buys the crabs from his son, who traps them. “If we hadn’t diversified, we’d be out of business a long time ago,” said Linda Boston, 66, who sells gator meat to walk-up customers at the farm near Sanford and to several Central Florida restaurants. Although the alligator-meat market is rebounding, the couple aren’t experiencing a windfall. That’s because gator-feed prices have doubled, and freight and other charges have risen, Jimmy Boston said. The Bostons sell their meat, which they process themselves, then vacuum-pack and freeze, for less than many retail outlets: $8 a pound. At Bar Harbor Seafood in south Orange County, by contrast, the price has held steady at $12.99 for the past few years, retail manager Scott Charron said. Gatorama charges $12 a pound for ribs and about $18 a pound for tail meat, but some online stores get as much as $25 for tenderloin, which comes from the tail. The tail and jaw meat is considered the most desirable, although soup and jerky can be made from the darker, tougher leg meat. The Florida Department of Agriculture says gator meat can be used in sausage, patties and taco filling, but fried gator bites are most popular and often are served with sauce. Farmed meat is more consistent in taste and texture, Register said. Flynn and the Bostons credit TV reality shows such as “Swamp People,” “Gator Boys” and “Growing Up Gator,” which last fall featured the alligator-farming Brooks family of Christmas, with raising the profile of alligator meat and increasing its value. Danny Lam, 28, who was visiting from Toronto last week, said he wanted to try gator because it’s a novelty. Like many other people, he said he liked it but found the texture chewy and tougher than other meats. Some diners say it tastes similar to chicken. There are about 1.3 million alligators in Florida. › Alligators have about 80 teeth, which are replaced with new teeth when they wear down. › An adult male can grow to 14 feet long and weigh more than 1,000 pounds. › Alligators can rip and swallow their food, but they can’t chew. › Alligators can live up to 50 years in the wild, longer in captivity. No Phantom Pains overnight, and one good nights sleep! Started my day off with some of the Jennie – O Turkey Bacon, free samples Jennie – O sent me for the Switch Club. I had Turkey Bacon, Poached Egg, Healthy Life Whole Grain English Muffin, and a cup of Bigelow Green Decaf Tea. Went to see my Dad after Breakfast, he wasn’t feeling too good today. They’ll keep Dad in rehab for at least 3 weeks I’d say. 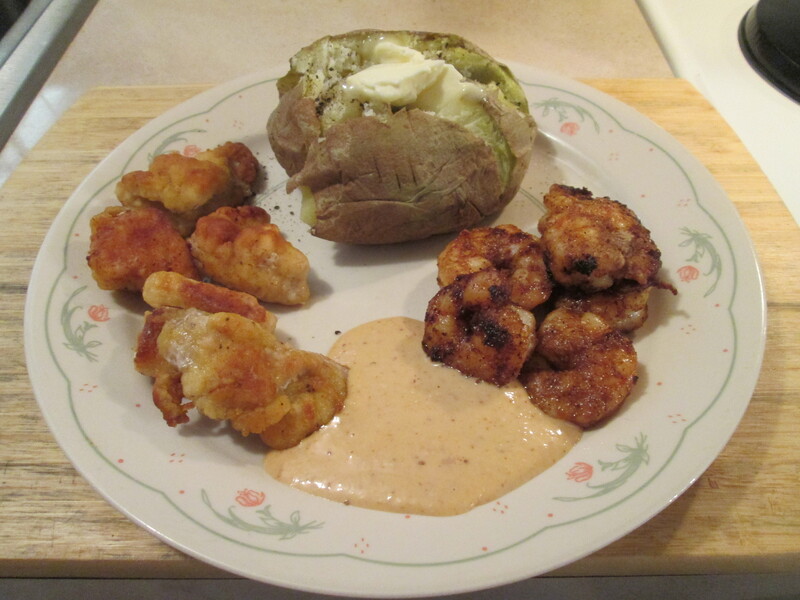 For dinner tonight I prepared a Surf (Shrimp) and Swamp (Gator Nuggets) w/ Baked Potato dinner! For the Surf part of my dinner I used Kroger Brand Jumbo Shrimp. I had the bag in the freezer so I laid it in the fridge overnight to thaw. I made Cajun Shrimp and to prepare it all I need is; 1 pound large shrimp (peeled and deveined), 2 teaspoons Zatarain’s Creole Seasoning, and 2 tablespoons Blue Bonnet Light Stick Butter. Then to prepare it I coated shrimp with the Seasoning. Melted the Butter in large skillet on medium heat. Added my shrimp; cook and stir 3 minutes or just until shrimp turn pink. I love Shrimp and I love to prepare them this way! The Butter and Creole Seasoning pair together to give the Shrimp an incredible taste. For the Swamp part of the meal I used Country Boy Gator – Alligator Tail Meat that I purchased online from Cajun Grocer. They have a great selection of anything Cajun you could want. I pan fried the Nuggets to Golden Brown, about a total of 8 minutes. Love the Gator Meat, as they say”It tastes like Chicken!”. It really does but it’s a tad sweeter than Chicken Meat. I served it with the absolutely best tasting Remoulade Sauce I have ever tasted, Louisiana Fish Fry Products Remoulade Dressing. Man oh man this stuff is incredible. It has that hint of Horseradish and just a tad of heat. 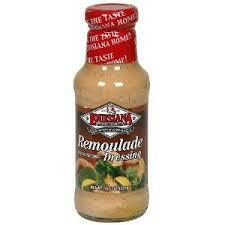 Perfect for any Cajun Seafood or Fish Dish. I also had a Baked Potato to complete the meal along with an Ice-Cold Bottle of Diet Dr. Pepper. For dessert later a Jello Sugar free Dark Chocolate Pudding topped with Cool Whip Free. Over 1,000 Authentic Cajun Food Products! Here at Cajun Grocer we carry over 1,000 Authentic Cajun and Creole Food Products including Fresh Cajun Boudin, delicious Mardi Gras King Cakes, select Crawfish, and of course our world-famous award-winning Turducken – voted best Turducken by The Wall Street Journal. So enjoy your visit here at Cajun Grocer, where the food is fresh and the people are friendly. Most people think of Cajun food as being extremely spicy, blackened foods. This couldn’t be further from the truth. True Cajun style cooking utilizes fresh, quality ingredients paired to create complementary flavors without the need for lots of seasoning. Additionally, Cajun food should never be overcooked. However, some dishes should be thoroughly cooked, allowing the flavors to meld together over time. If you want the freshest authentic Cajun food available, you’re going to want to start from scratch with the freshest ingredients. Our fresh Cajun food products are shipped from Louisiana in a custom-printed cooler packed with dry ice to ensure freshness when they arrive at your door. Whether it’s standard Cajun delights like gulf shrimp, fresh sausage, gumbos or stuffed breads, or more adventurous dishes like alligator, jambalaya, boudin, crawfish etouffee and live crawfish, you won’t be disappointed in the quality of our fresh food products. All of our fresh Cajun food products are shipped in dry ice for the freshest delivery possible. Had one of my favorite Breakfast items to start the day. I prepared some Turkey Goetta Patties with a Scrambled Egg and a Whole Grain English Muffin. With some fresh brewed Green Tea and the Sunday Paper, I was set! Still sunny, hot, humid out so not much going on. For dinner another favorite treat of mine Alligator. 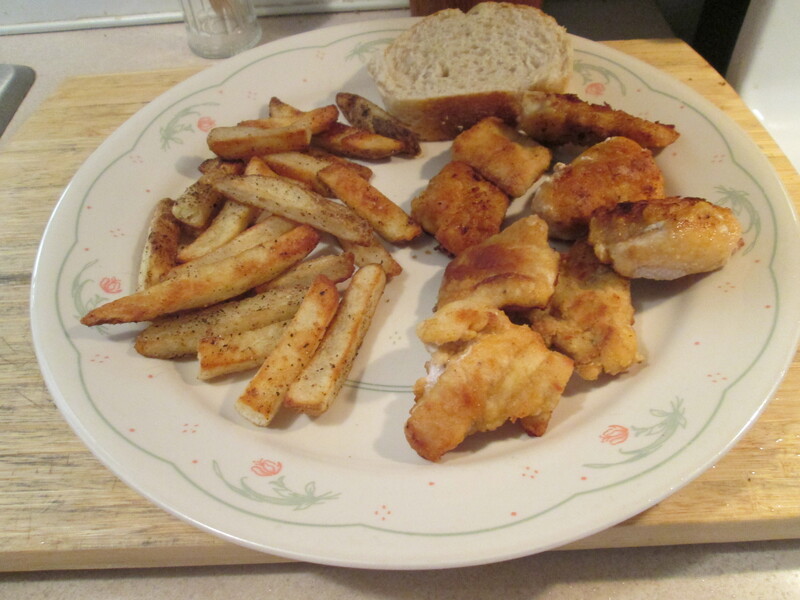 I prepared Alligator Nuggets w/ Baked Fries and Baked Rustic French Bread. 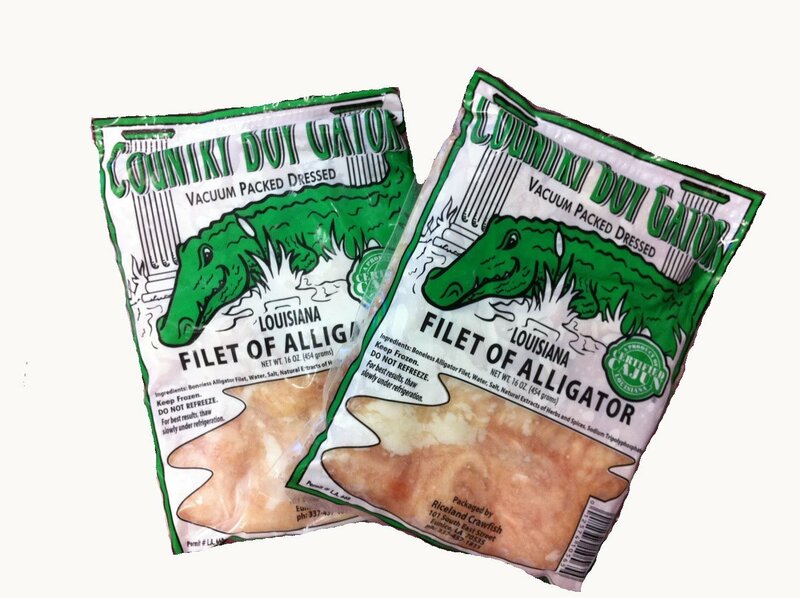 I use Country Boy Gator – Alligator Tail Meat that I purchase online from Cajun Grocer. They have a great selection of anything Cajun you could want. I pan fried the Nuggets to Golden Brown, about a total of 8 minutes. Love the Gator Meat, as they say”It tastes like Chicken!”. It really does but it’s a tad sweeter than Chicken Meat. I served it with the absolutely best tasting Remoulade Sauce I have ever tasted, Louisiana Fish Fry Products Remoulade Dressing. Man oh man this stuff is incredible. It has that hint of Horseradish and just a tad of heat. Perfect for any Cajun Seafood or any Fish. For one side I baked up some Ore Ida Simply Cracked Black Pepper and Sea Salt Country Style Fries, served these with a side of Hunt’s Ketchup for dipping. Then I also baked a loaf of Pillsbury Rustic French Bread. For dessert later a Healthy Choice Dark Fudge Swirl. Zesty, tart with horseradish and special spices, and guaranteed to liven up any salad or seafood. Soybean oil,horseradish(horseradish root, Vinegar, Salt),high fructose corn syrup, Creole Mustard (vinegar, mustard seed, horseradish, sugar, salt, dried onion, dried garlic, spices),distilled vinegar, egg yolk (Egg yolk, salt, natural flavor), Water, tomato paste,spices and colorings, salt,dried garlic,dried onion, caramel color, xanthum gum, calcium disodium ETDA to protect flavor and less than 0.1% sodium benzoate as a preservative. Use as a dipping sauce for shrimp, chicken etc. Great as a salad dressing.